a. 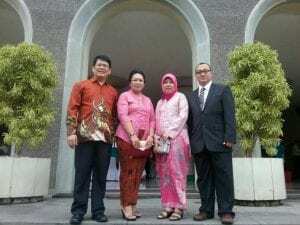 Dean | Dr. Budi Setyadi Daryono, M.Agr.Sc. | lead all of the process of teaching-learning, research, community services, and academic development in Faculty of Biology. b. Vice dean of finance, asset, and human resources | Dr. Niken Satuti Nur Handayani, M.Sc | responsibe to represent the dean in leading the process of general administration activity and everything related to the human resources and financial affairs of the faculty. c. Vice Dean of Academic and Student Affair | Rina Sri Kasiamdari ,S.Si., Ph.D | leading the process of teaching-learning and curricular education. d. Vice dean of research, community service, and colaboration | Dr. Eko Agus Suyono, M.App.Sc | represent the dean in research, community service, and cooperation with another institutions. 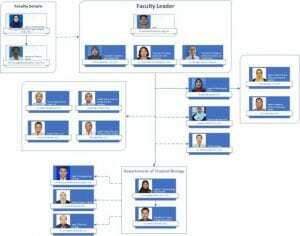 Ad Hoc team is a team that held based on the dean’s decree, which in charge to help faculty leaders in the implementation of the Three Pillars of higher education. Ad Hoc team consist of the Department of Research, Department of Community Service, and Department of Coorperation (BPPK), Faculty Plan and Management Team (TP3F), Curriculum Team, Plan and Development Team, Credit Number Assessor Team, Quality Asurance Team, Semester Coordination Team, Academic Coordination Activity Team, Career Guidance Team and Tracer Study Team. Library, Laboratorium, Biology Garden, Biology Museum, Faculty Administration Office.